I think novelists who want to write better should read poetry. 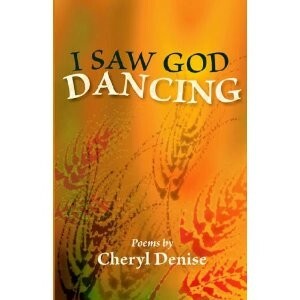 So on this Monday morning I’m taking a break from writing to read I Saw God Dancing, poems by Cheryl Denise. I think I’m setting myself up for a good day. The volume’s title is provocative, and as I start to read I can’t help searching for its inspiration, maybe a poem by the same title. The table of contents reveals no such poem, but I find the title’s roots in the first line of “Grace:” Mennonites don’t dance. Aha. I think a story is about to unfold. I’m pulled to the next page and “Mennonite Poet,” a vivid memoir of infancy to sixteen in six short sections. I’m not Mennonite, but I can relate to this upbringing in the church, and I love the four-year-olds as they’re taught to pray in Sunday School, “Our Father,” we awkwardly mumble/ cheeks full of crackers. no more farming or horse and buggies. Eli’s meadow and walked to the city. A policeman gave them a ten-dollar ticket. Patsy, my best friend, was Catholic. she thought four times a year wasn’t enough. the Priest made it into the actual blood. I love the voice in these poems and the frankness that strikes a blow at our assumptions about people who may dress and pray differently. We harbor such odd and unrealistic beliefs, even about people we think we know well. Maybe if we could read each other’s poetry we’d achieve world peace. Spread the word.